We provide a Vmware snapshot of a Ubuntu server with a running database and brickit webserver. 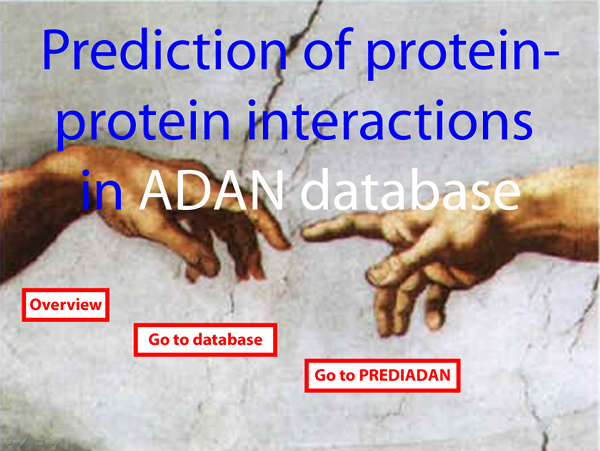 The ADAN database and related web tools are on line resources (http://adan-embl.ibmc.umh.es ) for the predictive analysis of protein-protein interaction between ligand and domain complexes. The main module of ADAN database contains a useful collection of different modular protein domains (SH2, SH3, PDZ, WW, etc.) mainly involved in protein-protein interactions. The entries in ADAN are well annotated and linked with other databases, offering all structural and functional information available on protein domains, thus making ADAN database suitable as a starting platform for homology modelling at genome-wide scale. The database contains more that 2500 entries, comprising different protein-protein interaction domains, enzymes and derived models that are manually integrated an annotated into ADAN to provide biological and functional information. Annotation is presented in abstracts containing references to other databases, biochemical and thermodynamical data, simplified coordinate files, sequence files and alignments. As a novelty, the database offers position specific scoring matrices for protein-protein interaction predictions that are used to predict optimum ligands as well as to search putative protein partners in the corresponding genomes. Additional interactive web tools were developed to allow users to scan a query sequence against selected matrices, or to improve a ligand interacting with a domain.